[alanamon] had an old pinball machine in his basement, and thought it would be cool to rig it up to serve as a clock as well. He didn’t want it to be just any clock however, he wanted the pinball machine to be the most accurate clock in his house. Other than telling time using the game’s scoring reels, there were two other things that he wanted to ensure with this build – that the game functioned normally when desired, and that the clock mechanism made no permanent changes to the game. To accomplish this, he dug around inside the machine and made all of his connections using clips secured to the game’s Jones plugs instead of drilling holes and soldering wires. The clock runs off an Arduino, which gets its its time data using an old GPS receiver he had kicking around. The receiver pulls time data from GPS satellites much like this clock we featured yesterday, updating the score reels once every minute. The clock can be programmed to turn the machine on and off at a scheduled time each day, and simply turning off the Arduino will allow you to play the game in its unaltered state. 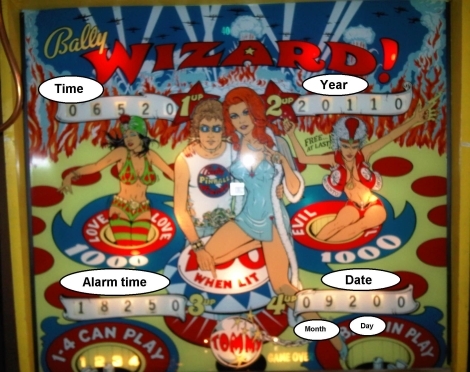 We never really contemplated using a pinball machine to tell time, but it works for us! Check out a video of his pinball clock in action after the jump. Whew! I was about ready to go atomic rage on this one, then I read that it still functions completely as normal with nothing lost along the way. Excellent mate! It should read “02011” not “20110”. It doesn’t matter to me much, but someone reading this who believes in the Y10K would probably start kicking up hell. About the 02010 vs 20100 thing, I initially thought the same, but it hit me right after. Many pinball machines had a dummy digit to make the scores look larger (which is obviously more exciting and quarter-worthy). The 1’s digit is most likely stuck at 0. I had clips on my Jones plug once, couldn’t walk straight for a week! BAZING! Anyway I think this is extra cool because he kept the machine totally unmodified and still added the clock, great work. I will have to RTFA here – I have some scoring reels in a box somewhere that should really be put to use! Excellent job keeping the machine intact. +10 for not altering the machine.. I have 3 working and a couple ‘Heads’ that would be good for this..
+1000 for not altering the machine..
Sweet. Very good work man. I’ve got an old 70’s Gottlieb EM pin, have always thought of doing the same thing. I also thought of using the chimes for the hour. It’s actually quite amazing to watch these old pins work… all those banks of relays clicking away performing logic without a single piece of silicon.